Western Star is a four piece rock’n’roll outfit out of Baltimore, Maryland that has been touring the U.S. successfully and continually for the last 3 years, establishing roots up and down the East Coast and all across the South. 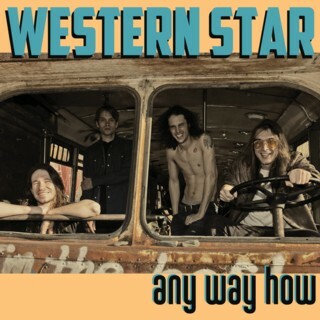 With producer/engineer J. Robbins (Jawbox, Burning Airlines) behind the board Western Star arrive with their second full length album, Any Way How. They’ve embraced a clearer and more concise approach and Robbins’ polished production sets this record up and apart from their first. Musically the band maintains the wheelhouse established on their debut, Fireball: A garage inspired brand of hard rock with a classic feel that has nods to the Irish blues boogie of Thin Lizzy and to their heroes the Old 97’s. Lyrically the new album reveals an almost desperate determination and taps experiences of love lost and personal struggle that are solidified into dark but never hopeless rock’n’roll anthems.